Brazilian, born on a busy avenue in the city of São Paulo. Become accustomed since childhood to see the constant movement of people during the day, to sleep with the noise of the cars at night. Orion has accepted the invitation of early streets. His first graffiti was done when he was only 14. The teenager instinct drove him while the harsh reality of street required him new ideals.Today, captures inspirations amidst the crowd of people; silences and thoughts; experiences and memories; of joys and sorrows. He is an artist that lives and carries the crowd. Mankind inhabits Orion: your time is unique, your universe is the collective space. In 2000, he discovered photography, same time I became interested in the theory of image written by Barthes, Dubois and Aumont. A year later, conceived Metabiótica, project chose a place where the city, applied a painting on the wall and, with camera in hand, waiting for the decisive moment in which people interact spontaneously with their paintings. Framing the exact situation, promoted unity between inks and real life, by simulating the encounter (or clash) between reality and fiction within the photographic field. It is crucial that the interaction between the pedestrian and the painted image when the picture of Metabiótica is generated, in contrast to traditional photographic pictures that convey the false idea that all that is real is photographic. In Metabiótica truthfulness is questioned: the paintings on the walls are in fact, people actually came by and acted spontaneously, however what we see suggests a type of mount that does not exist. It’s all true, it’s all lies. In 2006, he created Ossuary, intervention performed in a tunnel of. For 13 mornings, using only scraps of cloth, removed part of the thick layer of pollution that pervaded the uprights. Selectively wiping the soot discharged by cars, Orion was causing skulls appear on the walls. The tunnel has been turned into catacomb. Over 3500 hand drawn skulls flocked to remind us that the same black soot permeated the tunnel also darkens our lungs and our lives. Orion brought up the archaeological site of ourselves. During each morning for work, he experienced the deafening noise, the suffocating feeling of still air and the many police stops. But clean is not a crime. Pollute, yes. The extent to which Orion progressed, was explicit that no one could stop him. The only way to stop “cleaning” done by him, it was clean too. Weeks later, teams of city hall appeared to remove soot from occupied only by the intervention area. The remainder of the tunnel remained dirty. As if nothing had happened, Orion continued the work back to the town hall. This time the wash was complete. Crime was another: censorship. 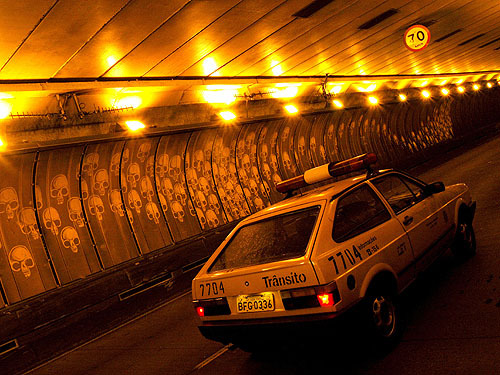 After the intervention, all city tunnels were cleaned. With frightening speed, washed every wall has to be black. The Ossuary message had already been given. But Orion did not stop. Back in the tunnels, he draws skulls and with scraps of cloth that uses, collects soot. Then he washes the cloths, waiting soot and decant water to evaporate until only the black dust expelled by the exhaust. This toxic substance that seemed to have no utility is transformed into pigment used in works of Art Less Pollution series. Are large paintings, with a stunning realism that with some irony, reminds us of old advertising images. Orion is using pollution to portray the seemingly harmless everyday that produces it. Alexandre Orion works intensively with urban intervention since 1993 using the urban space as a stage for the production of works that combine visual, photographic and audiovisual techniques. Published in 2006 the book Metabiótica. His works are part of collections of the Pinacoteca do Estado de São Paulo, Banco Itaú, Deutsche Bank New York, Padre Anchieta Foundation, Spencer Museum of Art among others. His designs have earned solo exhibitions in Sao Paulo, Salvador, Curitiba, Rio de Janeiro, Brasilia, Paris, Rotterdam, Miami, San Francisco, London and New York and have been published in over 10 languages, the major media outlets of the world .